Planning on spending a day in Venice? There's so much to do and so little time therefore to save you the hassle, here are my 6 must dos in the city. My best friend, Carla, and I did something a little spontaneous last week. We booked last minute flights to spend one day in Venice. When I say one day, I really mean 8 hours. For the grand total of £40, we took the first Easyjet flight out there and the last flight back and I have to say it's one of the best things we could have done. As we grow older, it is easy to get stuck in our routines and usual way of life but for me, it's become increasingly important to remind myself of my fun side and that I'm still bloody young. So why not do something so carefree as visit a new city mid-week!? And Venice is the perfect city for such an escapade. Beautiful surroundings, friendly people and out of this world food! We didn't want to leave! You can watch a snippet of our trip in the video above but below are my 6 suggestions for things to do in the city with only a few hours to spare! There's nothing better than throwing the rule book and map out of the window and just wandering aimlessly around the city. Venice kind of feels like it was made for just that purpose. With narrow, winding streets and numerous dead-ends, you'll have so much fun trying to work your way round the maze that this city is. It's the best way to come across sights you would never have dreamed of seeing if you had planned your route. Allow up to two hours to lose yourself in the streets of Venice. After all that wandering, you'll most certainly have worked up an appetite and if there's one thing Italians know how to do, it's lunch! Pizza, pasta, gelato...you name it, they do it better! Try some of the Venetian specialties that include all manner of seafood (you are by the water after all) and stuff your bellies until you can't fit another ounce in (and then pop in one more bite). Lunch for Italians is treated as an important ritual so don't expect to rush through your meal. Allow up to 2 hours to really savour your courses. Carnavale is officially in February in Venice but there are still hundreds of shops selling the most ostentatious masks you could ever dream up. I'd love to go one day but regardless, you can always pop into one such such store and have a mini dress up session. If you're lucky, you might even stumble across some being made and get to watch the process start to finish. Allow one hour to look through masks and observe how they are created. The height of all tourist attractions, San Marco Piazzo! Italian architecture in all its glory! You could spend hours exploring every intricate detail here. We walked around the square, spent some time in the cathedral (Basilica San Marco) and went up the tower (Campanile di San Marco) to get breath-taking views of the city as the sun went down! You don't have to pay entry for the cathedral but be ready to part with 9 euros to go up the tower. Worth it though! Allow a minimum of 2 hours to make pits stops at all attractions. 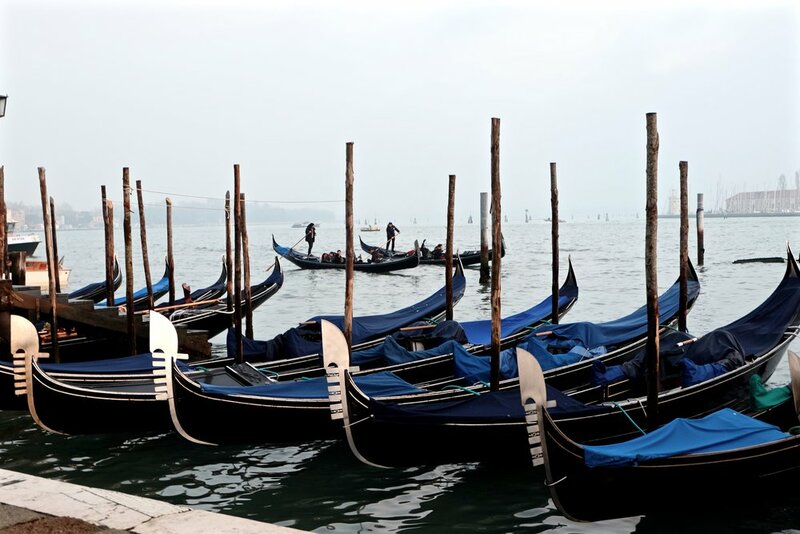 What else epitomises Venice as much as a gondola ride? I would have really loved to jump aboard one but it was 3 degrees and I couldn't keep still in case I froze on the spot. Plus, a 30 minute ride costs approx. 80 euros so thought I'd pass. But I took many a picture next to them so kinda the same thing right?! Allow a minimum of 30 mins for a gondola ride.